When and how do you treat colonies to have the greatest effect in minimising Varroa levels? At the end of this longer than usual post I hope you’ll appreciate that this is a different – and much less important – question than “When is the best time to treat?”. You probably use one of the treatments licensed and approved by the Veterinary Medicines Directorate (VMD), which include Apistan, Apivar, Apiguard, MAQS and Api-Bioxal. I’ve discussed the cost-effectiveness of these treatments recently. If used correctly, all exhibit much the same efficacy, reducing phoretic mite levels by 90-95% under optimal conditions. That being the case the choice between them can be made on other criteria … the ease of administration, the cost/treatment, the likelihood of tainting the honey crop, the compatibility with brood rearing, whether they mess up your vaporiser etc. After using Apiguard for several years, with oxalic acid (OA) dribbled in midwinter, my current preference – used throughout the 2015 season – is OA sublimation or vaporisation. This change was based on four things – efficiency, cost, ease of administration and how well it is tolerated by a laying queen. The how? you treat is actually reasonably straightforward. OK, but what about when? Because, if the treatments are all much of a muchness if used correctly, the when is actually the more important consideration. When might be partly dictated by the treatment per se. For example, Apiguard needs an active colony to transfer the thymol throughout the hive so the recommendation is to use it when the ambient temperature is at least 15ºC (PDF guidance from Vita). It’s worth stressing that this is the ambient temperature, not the temperature in the colony, which in places will be mid-30’s even when it’s much colder outside. At low ambient temperatures the colony becomes less active, and in due course clusters, meaning that Apiguard is not spread well throughout the colony, and is therefore much less effective. If you’re going to use Apiguard you must not leave treatment too late. For readers in Scotland it’s interesting to note that the SBA annual survey by Peterson and Gray shows significant numbers still use Apiguard in September and October, months in which the mean daily maximum temperature is ~14°C and 11°C respectively … so the average daily temperature will be well below the recommended temperature for effective Apiguard use. However, the when should be primarily informed by the why you’re treating in the first place. It’s not really Varroa that’s the problem for bees, it’s the viruses that the mite transfers between bees when it feeds on developing pupae that cause all the problems. Most important of these is probably Deformed Wing Virus (DWV), but there are a handful of other viruses pathogenic to bees that are also transmitted. DWV causes the symptoms shown in the image above … these bees are doomed and will be ejected from the hive promptly. 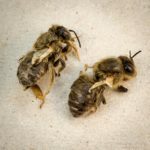 However, although apparently healthy (asymptomatic) bees have low levels of DWV, it’s been shown by Swiss researchers that DWV reduces the lifespan of worker bees, and that high levels of DWV in a colony are directly associated with – and causative of – overwintering colony losses. Therefore, the purpose of late summer/early autumn treatment is to reduce the Varroa levels sufficiently so that high levels of the virulent strains of DWV are not transmitted to the overwintering bees. When? therefore has to be early enough that this population, critical for overwinter survival, will live through to the spring – however long the winter lasts and however severe it is. However, before discussing when winter bees are reared it’s worth considering what happens if treatment is used early or late. What happens if you treat early? For example, mid-season or after the first honey crop comes off. Nothing much … other than slaughtering many of the phoretic mites. This is what most beekeepers would call “a result” 😉 Aside from possible undesirable side effects of treatment – like tainting honey, or preventing the queen from laying or even, with some treatments, queen losses – early treatment simply reduces mite levels. 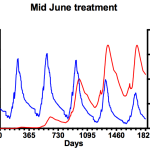 It’s important to remember that the levels may well not be reduced sufficiently to negate the need for a treatment later in the season … as long as there is brood being raised the mites will be reproducing (for example, look at the mid-June treatment generated using BEEHAVE modelling – image above). Furthermore, avoiding those undesirable side effects might require some ‘creative’ beekeeping (for example, clearing the supers and moving them to another hive) and will certainly inform the choice of treatment but, fundamentally, if the mite levels are high then treating earlier than is usual will benefit the colony, at least temporarily. If the mite levels – estimated from the disappointingly inaccurate mite drop perhaps – are dangerously high you should treat the colony. What happens if you treat late in the season? In midsummer workers only live for ~40 days. If mite levels are high, virus transmitted to these workers will shorten their lives, so reducing the colonies’ foraging ability and – possibly – ability to defend itself against wasps or robbing late in the season. 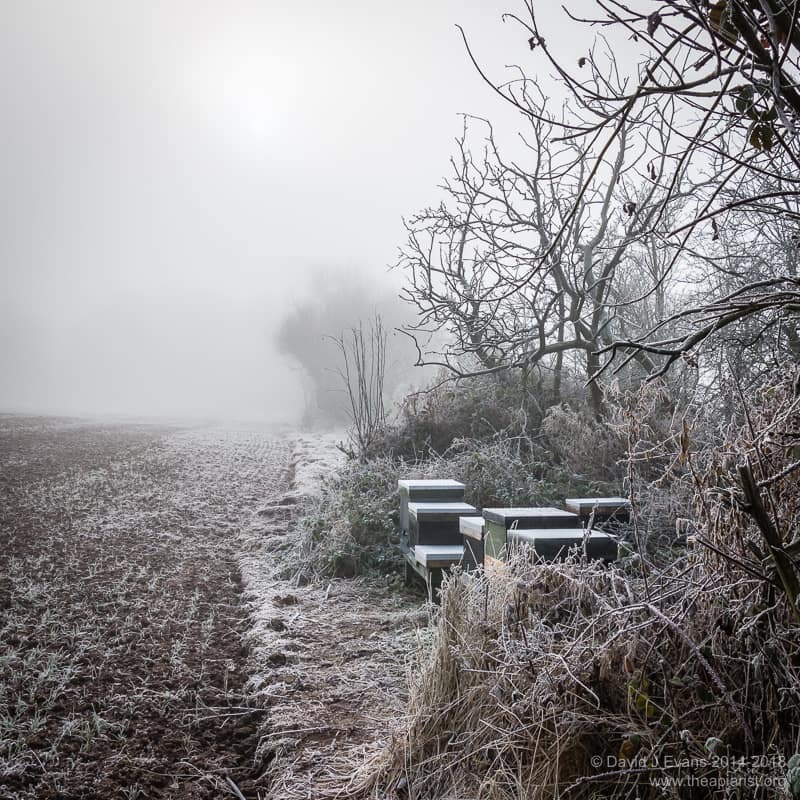 However, if you delay treatment until very late the lifespan of bees raised at the end of the season – the overwintering bees – will be reduced with potentially more devastating consequences. The usual winter attrition rate of workers will be higher. The cluster size of the colony will shrink faster than a colony with low mite levels. At some point the colony will cross a threshold below which it becomes non-viable. The cluster is too small to move in cold periods to new stores, resulting in the beekeeper finding a pathetic little cluster of bees in a colony that’s succumbed to isolation starvation. A larger cluster, spread across a greater area and more frames, is much more likely to span an area of sealed stores and be able to exploit it. 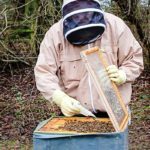 When are winter bees reared? In the Swiss study referred to above they looked at the longevity of winter bees. The title of the paper is “Dead or alive: deformed wing virus and Varroa destructor reduce the life span of winter honeybees”. We can use their data to infer when winter bees start to be reared in the colony and when mite treatments should therefore have been completed to protect these bees. Their studies were conducted in Bern, Switzerland, in 2007/08 where the average temperature in November/December that year was 3ºC. They first observed measurable differences in winter bee longevity (between colonies that subsequently succumbed or survived) in mid-November. This was 50 days after bees emerged and were marked to allow their age to be determined. By the end of November these differences were more pronounced. Therefore, by mid-November Varroa and virus-exposed winter bees are already exhibiting a reduced lifespan. Subtracting 50 days from mid-November means these bees must have emerged in late September. Worker development takes ~21 days, so the eggs must have been laid in the first week of September, and the developing larvae capped in mid-September. To protect this population of overwintering bees in these colonies, mite treatments would have had to be completed by the middle of September, so that mite levels were sufficiently low that the developing larvae weren’t capped in a cell with a Varroa mite carrying a potentially lethal payload of DWV. For Apiguard treatment (which takes 2 x 14 days) this means treatment should have been started in mid-August. For oxalic acid vaporisation (which empirical tests suggest is best conducted three times at five day intervals) treatment would need to start no later than early September and preferably earlier as it is effective for up to a month. Of course, these figures and dates aren’t absolute – the weather during the study would have influenced when the larvae would be raised as winter bees, with the increased fat deposits and other characteristics that are needed to support the colony survival through the winter. Despite the study being based in Switzerland my calculations on dates are probably broadly relevant to the UK … for example, the temperature during their study period is only about 1ºC lower than the 100 year average for Nov/Dec in Eastern Scotland where I now live. in mid-August the phoretic mite population should be decimated, reducing the transmission of virulent DWV to the all-important winter bees that are going to get the colony through the winter. This is a good thing. in mid-October the mite population will be reduced (not decimated, as it’s probably too cool to effectively transfer the thymol around the hive – see above) but many of the winter bees will already have emerged, probably with elevated levels of DWV to which they will succumb in December or January. This is a bad thing. Perhaps perversely, treating early enough to prevent the expected Varroa-mediated damage to developing winter bees is not be the best way to minimise mite numbers in the colony going into the winter. Using BEEHAVE I modelled the consequences of treating in the middle of each month between August and November¹. I used the default BEEHAVE setup as described previously. Figures plotted are the average of 3 simulations, each ‘primed’ with 20 mites at the start of the year. There’s a lot on this graph. To show colony development I plotted numbers of eggs, larvae and pupae (left axis) as dotted red, blue and black lines respectively. 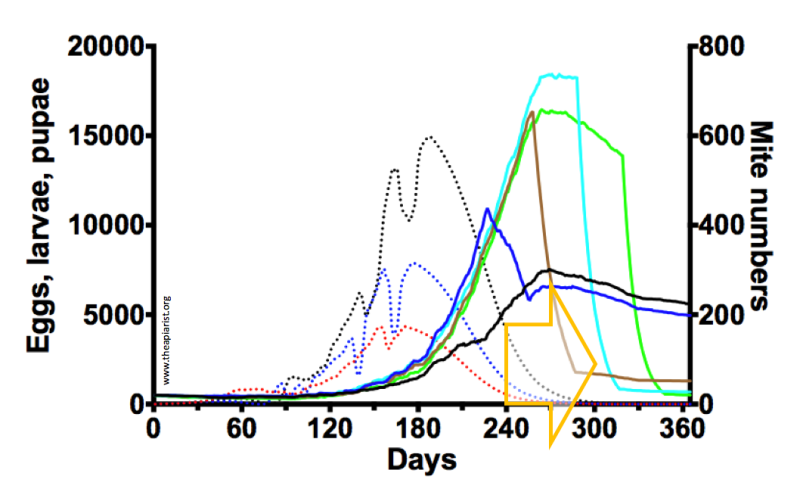 Mite numbers are shown in solid lines – treated with a generic miticide in mid-July (black), mid-August (blue), mid-September (brown), mid-October (cyan) and mid-November (green). In each case the miticide is considered to be 95% effective at killing phoretic mites. The gold arrowhead indicates the period during which winter bees are developing in the colony, based upon the data from Dainat. Treating at or before mid-August controls the late-summer build up of mites in the colony – look how the blue line changes direction. Mites that are not killed go on to reproduce in late September and early October, resulting in levels of ~200 at the year end. Remember that mites present in midwinter can, in the absence of sealed brood, be effectively controlled by trickling or vaporising oxalic acid (Api-Bioxal), and that this Christmas miticide application is particularly important if the autumn treatment has not been fully effective. In contrast, treating as late as October and November (cyan and green lines) exposes the developing winter bees to the highest mite levels that occur in the colony doing the year, and only then decimates the phoretic mite numbers, with those that remain being unable to reproduce effectively as the brood rearing period is almost over. 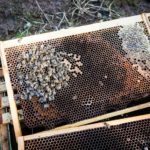 Starting treatment in mid-September isn’t much different, in terms of exposing the winter bees to high mite levels, than starting later in the year. So, within reason, treating earlier rather than later both reduces the maximum mite levels and helps protect the winter bees from virus exposure. Of course, treating as early as mid/late August may not be compatible with your main honey crop (particularly if you take hives to the heather) … but that’s another issue and one to be addressed in a future post. STOP PRESS There is a very important follow-up article to this. Kick ’em when they’re down describes why it’s so important to treat during a broodless period in midwinter to minimise mite numbers at the start of the following year. Just treating in late summer is not sufficient … you’ll protect your winter bees, only for them to be targeted by mites the following Spring. Overwintering honey bees: biology and management from the Grozinger lab. 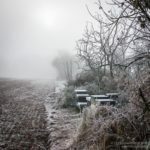 This entry was posted in Beekeeping, Varroa, Varroa control and tagged Apiguard, DWV, health, oxalic acid, Varroa, winter on February 5, 2016 by David. I used Apiguard in August last year and your post has convinced me to start using it even earlier in August this year. Supers off, Apiguard on! Supers off, Apiguard on is a pretty good motto 😉 You’re a lot further South than me. I suspect the queen will go on laying a bit longer for you. Of course, she’ll also probably start earlier meaning that the mite levels might build up faster 🙁 It’s clearly important to be vigilant and not just blindly follow a timetable. I have one final post on Varroa control which will bring everything together and make some suggestions for an approach that isn’t considered much in the UK, but perhaps should be. In other posts he definitely agrees that it’s vital to get the mites down before the winter bees are raised. Here I think he’s saying that even earlier in the season the mite problem is hidden and the this is when the viruses can take hold. I think there’s some complimentary research here but not sure how it translates into something practical. This post (When to Treat?) really assumes a UK-centric approach to mite control … late summer and mid-winter. The focus is on maximising the impact of treatment on the virus population, not on the mite population. Randy is being more expansive, discussing the consequences of the relative levels of mites and open brood suitable for mites to infest. As an aside, I think he has unwanted punctuation in the sentence “the mite success at invasion of a brood cell was directly correlated with the ratio of brood cells suitable for invasion, to the total population of adult bees in the hive” where he discusses the likelihood of a phoretic mite randomly coming into contact with a larvae of a suitable age. It’s not so much that the mite problem is hidden, it’s just that the ample larvae of a suitable age (in mid-season) means that the mites don’t spend too long being phoretic. How does this translate to practical beekeeping? I guess Randy will cover that in a future article. However, it’s clear that brood breaks – thereby preventing the mite from replicating (so reducing the basic replicative number/rate of increase that Randy terms ‘r’) – are beneficial. If there are no larvae to parasitise there’s more chance the phoretic mites will fall off, get lost through grooming of get too old to replicate. A natural extrapolation of this would be a shook swarm coupled with a miticide treatment of some sort – both removing infested brood and culling phoretic mites. This should be hugely beneficial. I think there are opportunities for novel treatment regimes within the season that, by exploiting the biology of the mite and the natural (and variable) reproduction rates of the bees, will reduce mite numbers in mid/late season … so protecting those all-important winter bees. Whether these become widely used is less clear … many beekeepers don’t manage to apply the current recommended treatment regimes properly. If we take off the supers to harvest the honey in say early August, and then allow 4 weeks for Apigard treatment, does this mean we should not feed the colony during treatment? If we don’t feed, doesn’t this put the colony at risk of starvation if the weather turns bad? I always used to do both simultaneously and never had any problems. I’ve not fed syrup for years, so can only comment on using Apiguard with fondant – see pic on the last link – which worked well. However, if there are some stores in the brood box and the weather is anything other than awful they should be OK. Apiguard tends to stop the Q laying – it’s a bit smelly – so their need for food reduces a bit as well. Trouble is – heather and rosebay willow herb will produce until early September, and don’t want to remove supers before then. Precisely … but if you leave treatment to late September you may be exposing the over-wintering bees to high levels of DWV. If you’re dependent on the heather for the annual honey harvest then you might have to take pre-emptive action to reduce Varroa levels earlier in the season. That way mite levels shouldn’t be too high and a smaller number of winter bees will be exposed to mites. Randy Oliver has a great quote on one way to achieve this – early splitting knocks the snot out of mite levels – though there are other methods that can be used.